Walking into the le Montrealais required walking though the Queen E and that is breathtaking; it’s enormous and so opulent. I mean this place is Montreal landmark. Once you get past the lobby you enter the dinning area and are greeted immediately by someone to take you to your seats. It is strongly suggested to make reservations remember this is an enormous hotel and there are people who are not staying at the hotel that go to eat there, so you can imagine that you may end up waiting a while, if you don’t call ahead. The dinning area is broken into different areas with a pretty big bar at the ground floor and a second floor. The entire area and washrooms are fully wheelchair accessible which is a big plus in my books. Before we got to eat we got a nice complimentary glass or orange juice and coffee that were constantly refilled. The orange juice refills is really great since no one else really does that. There are some serious food options here; you have breakfasty options, bread and cheese options, surf and turf, salads and desserts. There is a crepe station where someone will make you crepe suzettes with an option of 3 toppings; chocolate, English cream, and suzette sauce. They also have giant fruit bowl, fresh whipped cream and Crème brûlée in a small espresso cup. Next is a pasta station as well as an omelette station where you can get an omelette made in front of you with choice of topings . There was a cheese station with a wider assortment as well as bread station with various breads, croisants, and danishes. Lastly came the main food area with bacon, sausage eggs, pancakes, smoked salmon, mussels, fish, meat, salads and a huge dessert section. Now with all that background I will basically use my load up a couple plates and review them approach. If you are not familiar with my buffet approach I try to keep similar foods on one plate and review it as a whole. 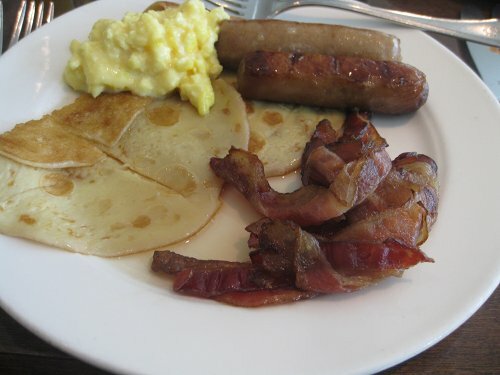 I started off with a classic breakfast: scrambled eggs, crepes, sausage and bacon. 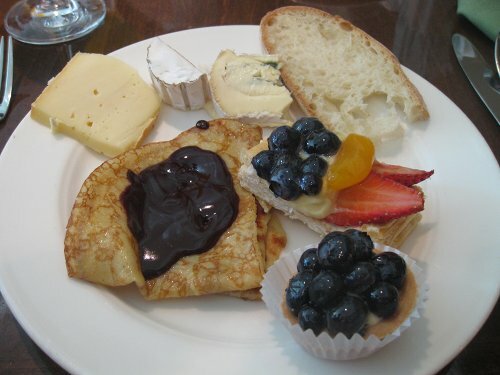 This is a typical breakfast dish, the crepes were good and very plentiful they were not too thick and I was able to load them up with syrup from the pitcher of fresh maple syrup. This was a real nice touch and to hold so much maple syrup in my hands made me very happy. The sausage was plump and short, and the bacon was tasty with a touch of crispy. The scrambled eggs were a little wet but I enjoyed them, although I would of liked some more eggs options such as sunny side up or benedicts but that would require a dedicated station and would slow things down since lots of people order eggs so I can understand why they did it that way. Next came the crepe station. These crepes were somewhat different from the other ones at the main station they had a chef working and prepping them with 3 sauces. 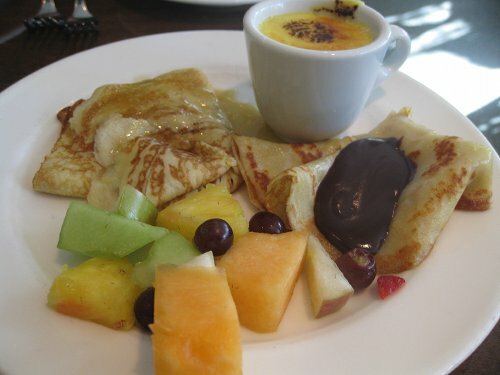 The crepes were prepared in a chafing dish and warmed up and drizzled with your choices of: suzette sauce, chocolate sauce and crème anglaise sauce. They also had some fresh whipping cream a large bowl of fruit salad as well as crème brulee and chocolate fondue in espresso cups. I had the chocolate topping as well as the suzette topping; both were great rich in taste and filling. The fruit was nice and refreshing to have and the crème brulee was amazing. I definitely had my sweet fix for the day. Next came the omelette station where I got a custom made omlette, I had to make a couple visits to this station since lineups could form and it takes a little time to make one so when it was free things blazed along. 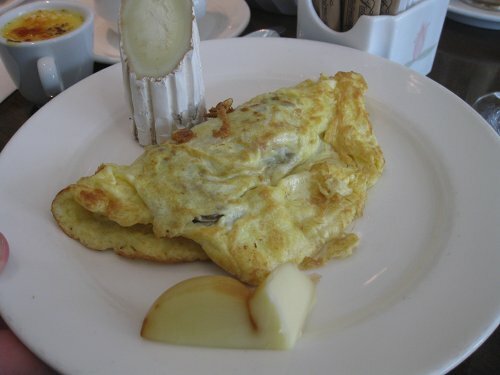 The omelette was very tasty and thick, I made sure to get all the topping of of meat, herbs, peppers, mushrooms, and another topping that I forget. I had some cheese on the side form the cheese station and the selection of the cheese was quite impressive, if you are lactose intolerant I was skip this since there’s lots of cheese and its really good. 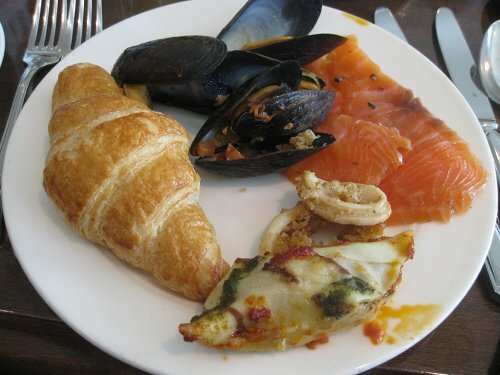 Lastly I had a combination of surf and bread I had a croissant, with mussels, calamari, smoked salmon and stuffed squid. The mussels were good, and one of the best I have had at buffets although I have had better at dinner places but I will settles for best of what I have reviewed. The stuffed squid was a nice addition and tasty. Lastly the smoked salmon did not disappoint at all and was a nice touch to the surf section. Service was impeccable, I have never had service so good. Our waiter was fun, cracking jokes yet professional and courteous. Our drinks were constantly refilled and plates were cleared by the time it took me to leave the table load up on food and come back. This is by far some of the best service ever and cannot say enough good stuff about our waiter and all the staff. With a varied buffet there are some good vegetarian and even vegan options. Granted they are more lunch like but you can get very full with an all you can eat buffet and the food is fresh and delicious so you will not feel trapped with no options. 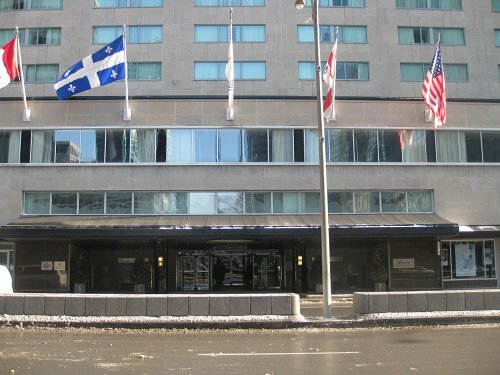 I was really impressed by Le Montrealais. The service and quality of food make this one of the best brunch buffets I have been to. I would of liked some more breakfasty options such as an eggs station and maybe my dream of an eggs Benedict station, but no one does that my knowledge. Le Montrealais offers great food for a great price in fact it is a few dollars more than other places and you get great taste and value for what you pay. It is a great location for groups, and events, make sure you book in advance since I can see how it can get full easily. fantastic review. This is exactly what i am looking for. I agree, a station for eggs bennedict would be amazing. It’s my favorite brunch thing. Thank you very much for your reviews. I am simply writing to let you know that Le Montréalais is no longer in operation. The hotel has been completely transformed over a year of major renovation. The new restaurant replacing it is named Le Rosélys, the space looks incredible, two floors high ceiling with an incredible light, open space. The cuisine is looking directly in the main dining room. The reviews are awesome! The brunch is now offered in a updates version! In addition, High tea is also offered daily. It would be nice to have the dates along with your reviews. Time goes by so fast.